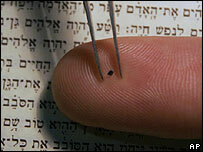 Researchers in Israel say they have succeeded in putting a version of the Bible on a chip smaller than a pinhead. Its 300,000 words in Hebrew were inscribed on a silicon surface at the Haifa Institute of Technology. Scientists say the aim of the project is to increase young people's interest in nanoscience and nanotechnology. It was written using a device called Focused Ion Beam (Fib). "When we send the particle beam toward a point on the surface, the gold atoms bounce off of this point, thus exposing the silicon layer underneath," Ohad Zohar, one of the project's managers at Technion, said. "By sending a particle beam towards various points on the substrate, we can etch any pattern of points, especially one that represents text." The next step for Technion researchers is photographing the Bible and displaying it on a giant wall within the Faculty of Physics. "In this picture, which will be 7m by 7m (23ft by 23ft), it will be possible to read the entire Bible with the naked eye (the height of each letter will be some 3mm - 0.1in)," Mr Zohar said. "Near this picture, the original - the nano-Bible itself, which is the size a grain of sugar - will be displayed."